by Quinn MacDonald. Written on 2013-08-15. Published in Reviews from the ISE Chronicle. As an English Lit student, I have experienced most of Shakespeare’s plays primarily as a reader, paying perhaps too much attention to individual words, and ignoring stage directions altogether. I actually haven’t read Measure for Measure, so it was a nice change to experience the play first as a viewer, especially when it was so well done. 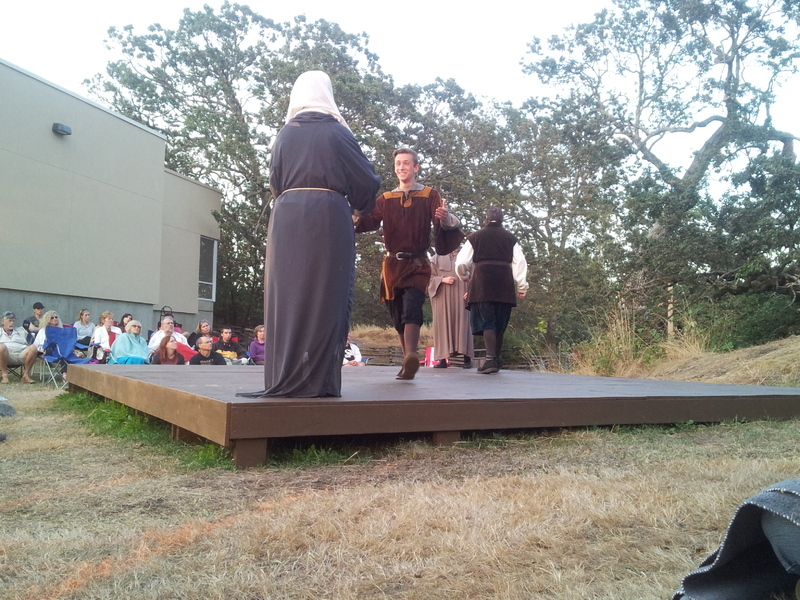 Greater Victoria Shakespeare Festival (GVSF) is just finishing up their 10th season, and their experience showed with this polished production. 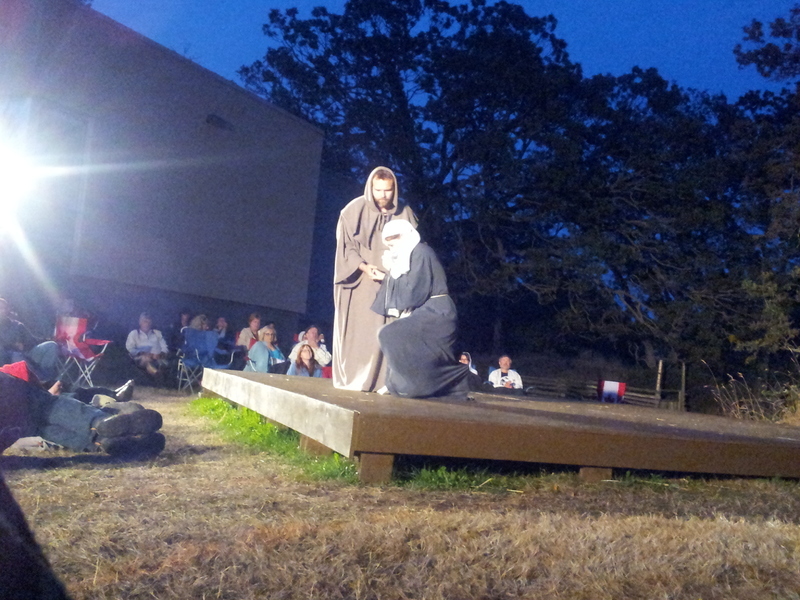 The open-air setting and simple, slightly elevated stage meant every chair and blanket spot felt up-close and personal, with actors entering and exiting the stage via lanes that cut through the audience. 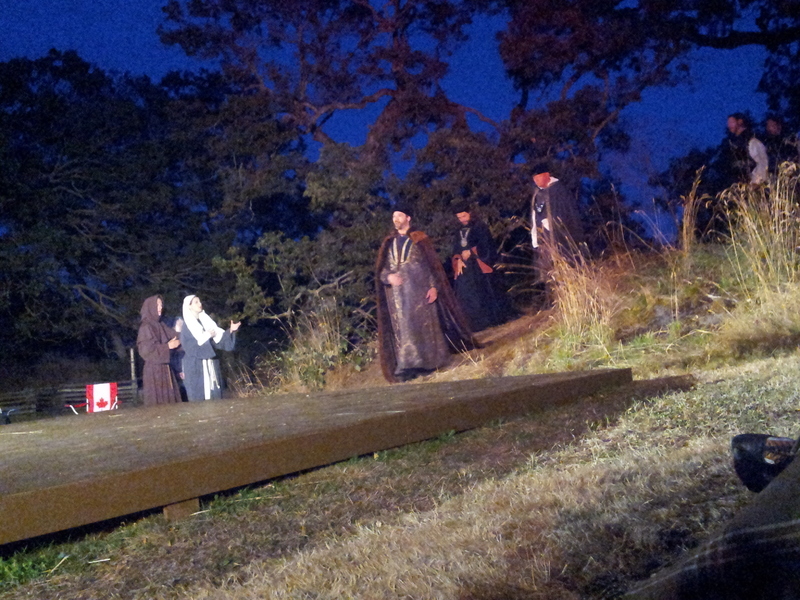 A small rocky outcrop behind the stage made up the set design, while Camosun College’s beautiful grounds and Garry oak trees provided a refreshing backdrop. The casual atmosphere changed slightly in the second half, as gathering darkness heightened the drama and bright lights brought the actors into sharper focus, complimenting the play’s themes of accusation and sin. The acting was quite strong. Ariel Slack played a perfectly dramatic Isabella, covering her character’s emotional range without ever becoming shrill. However at times I was unable to hear her, particularly during her pleading, because it took place at the opposite end of the stage, facing away from me. My companion thought Julian Cervello’s Angello should have been a little more evil, but I disagree. To me, he seemed like a playground bully’s sidekick, all grown up but still bitter from past slights, who has accidentally found himself in a position of power—hard to take serious, yet all the more distressing because he was being taken so seriously. This also provided a strong contrast with Justin Guthrie’s eloquent and firm Duke Vincentio. I also really enjoyed Blair Moro’s Lucio. His part could be easily overdone, but he kept it in check and let the Bard’s humour speak through him. His delivery method actually kind of reminded me of Jonah Hill, although I’m not sure if Moro would find that a compliment. Michael Bell (Claudio) has been acting in Victoria for five years, and it shows. His confidence and youthful appearance (complete with Macklemore haircut) worked to his role’s advantage, but his sharp delivery and constantly furrowed brow were at times almost too much for such a casual environment. The pared-down set put extra focus on the actors, and their success reflects highly on Clayton Jevne’s direction and Rowan Hebert’s stage management. Before the play began, a spokesperson acknowledged that it was to take place on land that is the traditional territory of the Lkwungen, Esquimalt, and W̱SÁNEĆ peoples. (The University of Victoria campus, from which I write this review, rests on the unceded land of the Lkwungen and WSÁNEĆ Coast Salish Territories.) At many of the events I have attended lately, both scholarly and otherwise, territory acknowledgement has often felt rote and recycled. But GVSF seems to have thought slightly more about what that acknowledgement means and how to work it into their practice, and for this I commend them. 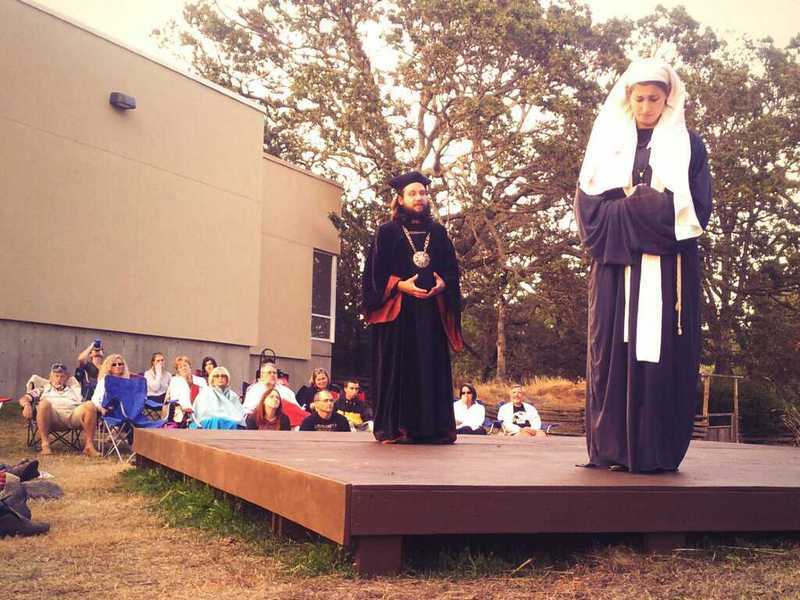 Measure for Measure takes place on “The Camus Stage,” which the program explains comes from the camas bulb, while “Camosun” (or “place for gathering camas”) was a name for the area that is now downtown Victoria. Additionally, Camosun’s Na’tsa’maht Gathering Place provides the venue for GVSF’s other production, The Merry Wives of Windsor (“Na’tsa’maht” is a Salish phrase that means “working together as one”), with the program providing information about the history of its architectural design. Overall it was a lovely way to spend a summer evening. They only have three shows left, but if you find yourself free this weekend, I highly recommend you grab a lawn chair and head over.